Soaring prices and a limited number of homes on the market haven't stopped foreign buyers from dropping a record amount of money on American real estate in recent months. International buyers purchased $153 billion worth of existing homes in the U.S. from April 2016 to March 2017—up 49% from the same period a year before, according to a recent National Association of Realtors® survey. They bought 284,455 properties, a 32% increase from the previous year. However, despite how impressive that sounds, it represents only about 5% of existing-home sales. "The political and economic uncertainty both here and abroad did not deter foreigners from exponentially ramping up their purchases," Lawrence Yun, NAR's chief economist, said in a statement. "Foreigners increasingly acted on their beliefs that the U.S. is a safe and secure place to live, work, and invest." NAR surveyed nearly 6,000 Realtors® in the spring for the report. Foreign buyers are defined as those who don't live in the U.S. as well as recent immigrants who have been in the states less than two years or have been here on a visa for at least six months. Nonresidents made up about 42% of sales, while recent immigrants made up the remaining 58%. The report looked only at existing homes, and not newly built properties. Who's dropping the most dough on U.S. real estate? Chinese buyers spent the most on American real estate for the fourth year in a row. They dropped a whopping $31.7 billion, up 16.1% from the previous year. They also bought the most housing units, at 40,572, a nearly 39% year-over-year rise. Our friendly neighbors to the north, the Canadians, spent quite a bit themselves—about $19 billion. This was more than double how much they dropped last year. That's because the U.S. is still a bargain, with the average existing-home price of $287,500, compared with Canadian cities such as Vancouver and Toronto. Don't believe us? The average price in Greater Seattle is $483,400 compared with $700,380 in Greater Vancouver and $603,781 in Greater Toronto, according to the report. Buyers hailing from the United Kingdom, Mexico, and India completed the top five, spending a respective $9.5 billion, $9.3 billion, and $7.8 billion. They were followed by buyers from Brazil, Venezuela, Germany, Vietnam, and Japan. What are the hottest markets for foreign buyers? Perhaps surprisingly, the home state of cosmopolitan New York City didn't even crack the top five for international buyers. Instead, Florida topped the list, with about 22% of sales. It was followed by California, at 12%; Texas, at 12%; New Jersey, at 4%; and Arizona, at 4%. New York state came in ninth. "Vacation buyers typically look for warmer locations with affordable prices," says Hale. "Florida and Arizona are both states where they find that." Canadians preferred Florida for its enviable weather while Chinese buyers chose California, which is easier to reach from Asia. And Texas, with its border location, was tops for Mexicans. Meanwhile, New Jersey was hot because it's close to New York City—and costs quite a bit less, she says. 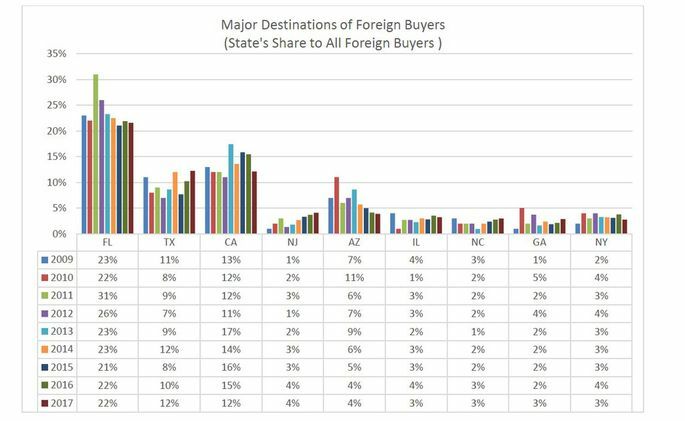 The largest share of foreign buyers—about 49%—are looking for homes to live in for the majority of the year, according to the NAR survey. Also, 18% are seeking investment properties and about 12% want vacation homes. "What's been happening in the last year and a half is foreign investors are looking to generate income. But returns in [more expensive] locations, such as in New York City, today are very low," says Edward Mermelstein, an attorney specializing in foreign investments at One & Only Realty, in New York City. So investors are "moving to secondary markets like Florida and Texas." What kinds of homes do foreign buyers want? American buyers shouldn't panic, though. Most foreign buyers aren't competing with locals as they're buying much more expensive homes. Foreign buyers paid a median $302,290 for their new abodes—about 28.2% more than homegrown Americans did. And about 72% of buyers living abroad paid all cash, compared with 35% of immigrants already living in America. "In places like New York and San Francisco, developers are building for foreign investors who are willing to pay a much higher price," Mermelstein says. Because typical Americans who don't have millions stashed in the bank couldn't afford these properties anyway, "there’s really no competition for the local buyers." In smaller markets such as Orlando, FL, foreign buyers are seeking more modestly priced residences, in the mid-$200,000 to $300,000 range, near the local attractions, says Orlando-based Realtor Gilda Santacana of Re/Max Town Centre. She works with many Canadian and Indian clients. "Some of the [Canadian buyers] like single-family houses and townhouses, but they need to have a pool," she says. "They use them as vacation homes." Most of her Indian buyers, on the other hand, are purchasing investment condos and townhouses they can lease out. The properties are generally cheaper than single-family homes, and they don't have to worry about maintenance, which is covered by homeowners association fees. But regardless of where they come from, all of her clients "want to be in the best location. They want to be in the city or very near it," she says. "They don’t want anything far." Will foreign buying continue to reach new highs? Despite the banner year, foreign buying might start cooling off. Chinese buyers are finding it harder to purchase American property due to tighter regulations on money leaving China, and weaker Canadian and U.K. currencies could also affect home buying. Plus, there simply aren't enough properties on the market. "Stricter foreign government regulations and the current uncertainty on policy surrounding U.S. immigration and international trade policy could very well lead to a slowdown in foreign investment," NAR's Yun said. But he expects that stronger U.S. and foreign economies will keep buying at a robust level. There's been an increase in buyers from Eastern European countries as well as the Middle East, says Mermelstein. As oil prices remain low, investors are looking for other ways to generate income—and U.S. real estate is a safe bet. Home Prices Are Continuing to Fall; by How Much?